The Business Continuity feature allows you to choose a phone number (aside from your office number) to receive calls in the event your office phone is not reachable, disconnected, or service is unavailable. Once phone continuity issues are resolved, the feature automatically sends calls back to your office phone. For example- if you lose power during a thunderstorm, calls are automatically routed to a pre-determined number. How do I set up Business Continuity for a phone number within My Site? A. How do I set up Business Continuity for a phone number within My Site? Go to Set Business Continuity. Click the Business Continuity button. Select the number you would like to configure and click Edit. Determine the forward to numbers. Options include: Internal, External and Do Not Forward. If Internal is selected, a dropdown will appear and allow you to select a predetermined number. You will have the option to automatically send calls to voicemail once forwarded by checking the Send to voice mail box. You can also set all the numbers to forward to this number by checking the Set all numbers to this phone number box. 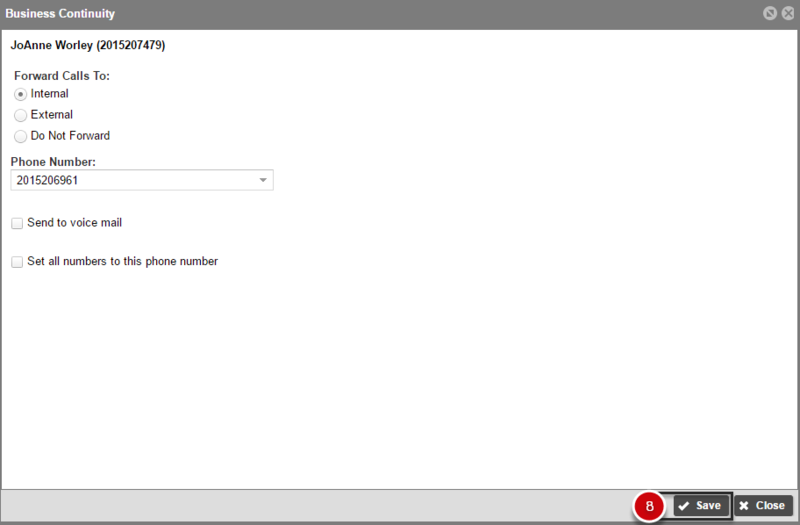 If External is selected, enter the external number you would like to forward the calls to. You can also set all the numbers to forward to this number by checking the Set all numbers to this phone number box. Make your selection and click Save.